By Dr Iain Young from the University's Institute of Integrative Biology and research associate Benedict Brown. "British and French fishing vessels clashed recently (quite literally) after a conflict over access to grounds for dredging scallops came to a head. The 'scallop wars', as they have come to be known, have been raging in the English channel for years. With fish stocks globally having halved since 1970, despite global demand for seafood still on the rise, the fishermen of the two countries have been competing for ever-dwindling resources. In an attempt to protect stocks, France has imposed a moratorium on the fishery from May to October; one that British vessels are under no obligation to obey. The French also claim that British vessels are fishing within their exclusive territory extending 12 miles from their shoreline. The Great Atlantic scallop (Pecten maximus) is a large species which is popular in Britain, but more so in France. ‘Scallops’ comprise a number of bivalve species within the family Pectinidae. They range between 5 and 20 cm in length with a bilaterally symmetrical, corrugated shell encasing an adductor muscle, gonad, mantle, gills, and digestive tract. The adductor muscle is known as the ‘meat’, and the gonad is the ‘roe’ or ‘coral’. Great Atlantic scallops reach sexual maturity around two years and may live up to 20 years. How do we catch more now? There are two methods of catching scallops in use today. ‘Hand-dived’ scallops are harvested by divers, who pick them up from the seabed. While this is the least damaging and most selective method of harvest, it is far more expensive than the alternative. The second options is dredging, whereby large ploughs or dredges are dragged along the sea floor, collecting they unearth from the seabed. Dredging is non-selective and highly destructive, and the intended species generally makes up no more than half of total catch. CEFAS published and assessment of the sustainability of the fishery earlier this year. Total catch in British waters has declined since 2009, suggesting overexploitation, and a lack of scallops over 6 years old in sample dredges reinforces this suggestion. Okay, those options don’t sound great, so why don’t we just farm them? 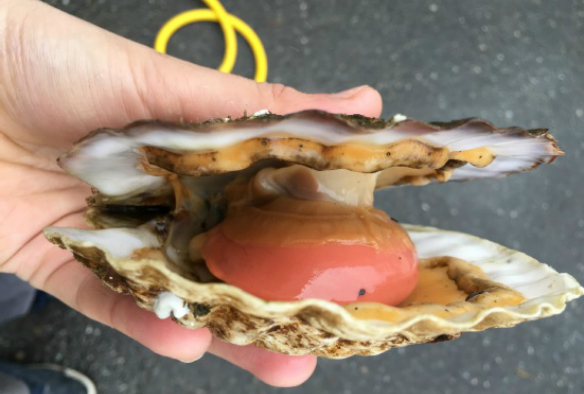 With demand for scallops showing no sign of decreasing, and wild-catch being fully exploited, markets may turn to aquaculture to meet their demand. 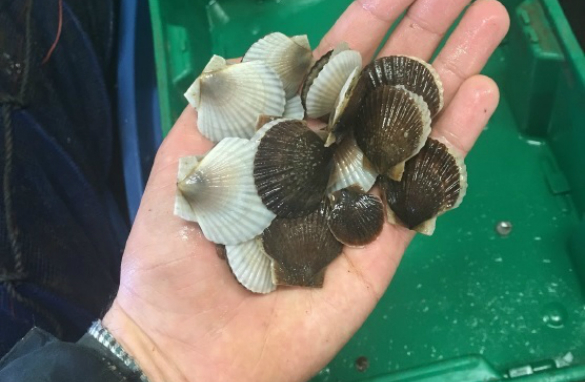 Globally, production from scallop cultivation reached 2.1 million tonnes in 2016 with the majority of this from China and Japan where the Yesso scallop (Pecten yessoensis) is favoured. However, scallop aquaculture is challenging, particularly as rearing scallop larvae is notoriously difficult. They are less hardy than other equivalent bivalve groups, and very sensitive to fluctuation in salinity, temperature and pH. They are also susceptible to infection, and are particularly vulnerable during metamorphosis, when the larvae develop their foot and settle onto a substrate. To culture larvae a constant supply of live algae, warm and very clean water (warmer than ambient British sea surface temperature) and constant aeration is required. Even achieving all of these, the larvae are prone to infection. Research to address these gaps in our knowledge is badly needed. How can we end the scallop wars? The answer is uncomfortably simple; either catch fewer scallops, or find an alternative source. The Seafish report suggests rotation of harvest sites, long term monitoring of stocks, and periodic closure of sites to allow replenishment: in other words establishing a well-managed fishery. Alternative sources rely on improving and increasing cultivation and production, tackling the issue of infection in larvae, improving water quality management and finding better sources of feed."